In the Touareg language Tamasheq, Kel Assouf means both “those with nostalgia” and “sons of eternity”. 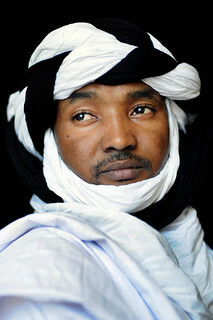 The group first came together in Brussels in 2006 around the exiled Touareg musician Anana Harouna (photo). From the early days, Kel Assouf built itself around two central ideas, the promotion of Touareg culture and the struggle against discrimination. “Tin Hanane” (Igloomondo 2010) brought the group wide exposure, enabling them to tour successfully around Europe with its intricate blend of Touareg (desert blues) music and a strong contemporary sound. In the words of the band, their second album, “Tikounen” (surprise) is meant to “express the stupefaction and perplexity created by a world where war, injustice and pollution are running wild”. With one foot in the desert and the other in the urban jungle, the bandleader Harouna writes about the Sahara, Niger and everyday life both there and in Europe. Using short phrases similar to Japanese haikus, he sings his poetry about humanity and respect. The result is a powerful sound with trailing drums, precise guitar riffs and singing in Tamasheq. It sounds like a Hendrix-era rock band playing Malian music. 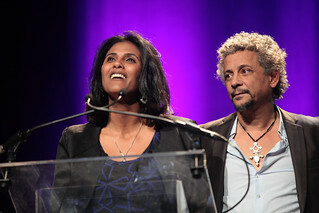 Since the first album, Anana has introduced a new band line-up that has been notably completed by the arrival of Toulou Kiki, the protagonist from Abderrahmane Sissakoqui’s award-winning film “Timbuktu”. She enriches the feminine tradition of the Touareg culture. The Tunisian producer and musician Sofyann Ben Youssef brings new invigoration to Kel Assouf by creating a distinctive trad-modern sound. One can even talk of a hyper-modern sound on the edges of today’s Touareg music production. The African trance rhythms played by rock musicians transport us to a dancefloor somewhere between London and Niamey – a powerful groove machine!